got the chance to sit down with Rolles Gracie and discuss training, his last fight in the UFC and about his abrupt dismissal from the UFC after only one fight. Ryan Justason: You defeated the 2nd ranked Judoka in Russia. Can you tell us about that fight? Rolles Gracie: It was actually my first fight in China. It was my second fight in MMA. I was very surprised with the thing that they set up. So the event was very nice. The guy was tough and he gave me a hard time but I got on the choke. The rear naked choke. RJ: Your last fight was against Joey Beltran where you fought with a broken fought. Why did you decide to fight? Rolles Gracie: To be honest, I was so excited with the fight and going to the UFC. I kinda didn’t want to disappointthe people who wanted to see me fight from Canada, Mexico, just all over the place that wanted to see me fight. I thought that I could have that fight with a broken foot. I then realized during the fight that the foot wasn’t the problem. It was actually during training because I couldn’t train properly and I had to take the training lightly which my cardio went down. I think that was the biggest problem during the fight. It wasn’t the foot itself. I will be 100% for my next fight. RJ: Was there a lot of pressure in that fight considering your Gracie name and all things considered? Rolles Gracie: No man. I just felt normal pressure. It’s the same for every event whether it’s the UFC or not. But again, the problem was with the foot. People don’t really know what they are talking about to say that the pressure was from the name. I don’t really believe in that. RJ: Considering your foot was broken, do you think it was a fair dismissal from the UFC? Rolles Gracie: To be honest, I was very surprised. I was surprised with the dismissal. I’ve never heard of anybody who got dismissed with one fight. I don’t know what kind of expectations the expected. It was a very disappointing performance. I didn’t perform the way I wanted to. All my friends, all my training partners, everybody was shocked by my performance, including myself. I knew that the next fight, I had to prove a point. I was ready to make that but then the notice came and I couldn’t believe it. Anyway, I just got to train harder and work my way back to the UFC. I think the same way my name opened the door, it kind of shut the doors also. If I had beat Joey in a minute, they would have gave him another chance. I think I need another chance. RJ: A study proved that Brazilian women get the most plastic surgery out of any women from any other countries. Why do you think that is? Rolles Gracie: (Laughs) I don’t know man. It’s kind of new to me too (Laughs). RJ: How’s training been going? Rolles Gracie: Trainings going good. Right now I’m able to do some ground. I’ve been swimming and lifting some weights and ground. No wrestling, no takedown, no boxing and muay thai. Just working on my jiu jitsu game and I’ve been having fun with it. RJ: Any word on your next fight? 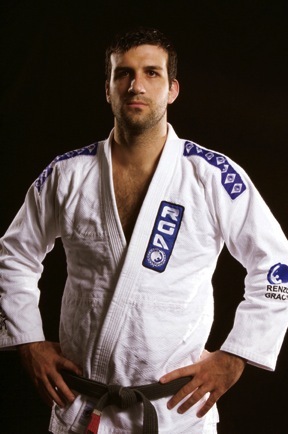 Rolles Gracie: Not yet man. I just want to be able to train and everything. I want to work on that stuff. Right now, I just want to back away and be able to give it 100%. I have to be able to work properly with boxing, wrestling and muay thai to get another fight. RJ: You share the mutual manager to Braulio Estima who I recently interviewed and he told me that your manager got him his 4 fight deal with Shine Fights. Are you also looking to fight for Shine Fights? Rolles Gracie: Yeah. Actually, a lot of organizations have contacted my manager when they heard about the news. Not only is there the UFC but right now I just want to weigh my options and see what is best for me and my camp. My camp will actually decide and my manager, trainers and Renzo [Gracie]. I just want to worry about training and get my foot better. ThatMMAGuy would like to thank Rolles for his time and also for being a great guy. I live near the NYC area and Rolles was nice enough to invite me to come train at his school or any Renzo Gracie school near me. Thanks Rolles!